Whilst all Finnish Lapphunds can trace their pedigree back to the original foundation dogs, Hugo seems to get there quicker than a lot of other dogs i've been drawn to. I was looking for a pedigree that was a little different and offered me some exciting and fresh opportunities and i believe i've found it in this boy. 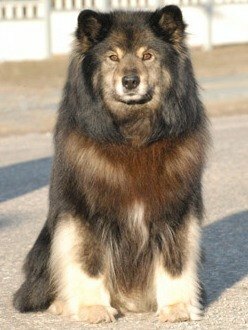 I contacted his breeder, Saara, about Hugo and she was quite happy to provide advice, explaining all his good points and pointing out his faults. 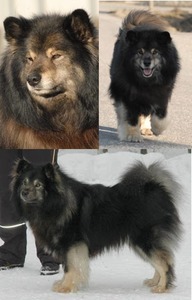 Saara reports that Hugo has good bone, very nice angulation, a good tail and lovely movement with nice reach and drive. He has a nice head with slightly light eyes and larger than medium ears. But we love his rounded ears. They're very cute and a bit of a trademark of early Shacal dogs. 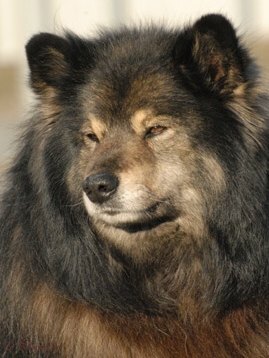 He has a profuse coat with lots of feathering on his legs and is a dark wolf sable. 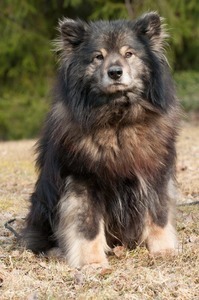 When we collected Hugo, at 8, he had a lot of energy still, but doesn't stray from his owners on long walks through the forests surrounding the family home. He lives at home with 2 other males, including his son, and is easy to handle in the ring. Hugo attained his Finnish Champion Title at 2 years and 1 month. Our sincerest thanks to Saara Sampakoski for her invaluable assistance in selecting this boy and arranging all the details of his collection. He celebrated his 13th Birthday in 2017, still in great health and condition. He's a truly gorgeous boy and we're very grateful to have a small piece of him here.